North Korean leader Kim Jong-un’s charm offensive continues with his first meeting with South Korean President Moon Jae-in in the Demilitarized Zone on Friday. At the end of the third Inter-Korean summit, the two leaders inked the Panmunjom Declaration to show their commitment to the denuclearisation of the Korean peninsula, the future establishment of a permanent peace regime, and the resumption of economic and political exchanges. Many signs might suggest this newest declaration does not address the specifics of Pyongyang’s intention regarding its nuclear arsenal. Yet the fact that the two Koreas – and the international community – greeted the summit with great joy should serve as a meaningful reset for a new peace in Korea. And beyond examining the potential of Panmunjom Declaration itself, symbols also matter when taking the two Koreas’ careful preparation for the summit into account. How the two Korean leaders acted may say a lot about their intentions, given the Declaration’s ambiguities and the uncertainties of the upcoming Trump-Kim summit. 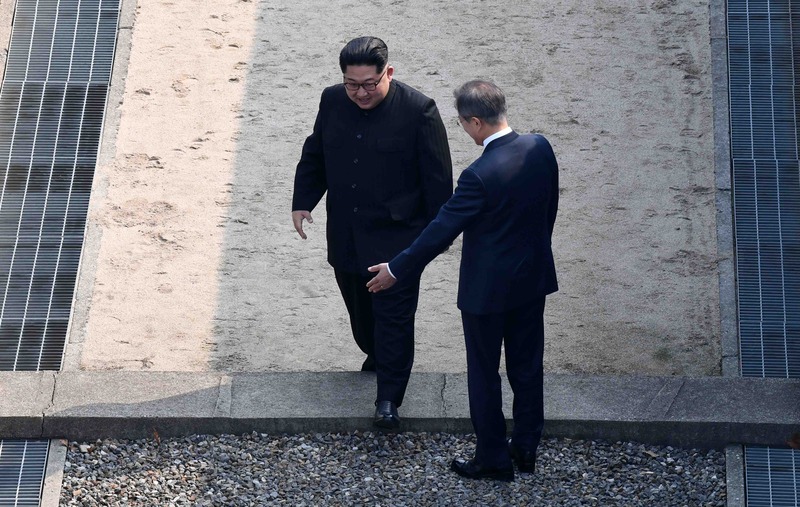 The handshake between Kim and Moon at the military demarcation line went off script when Kim invited Moon to set foot on the North. Moon had asked an open-ended question about when he would be able to visit North Korea. 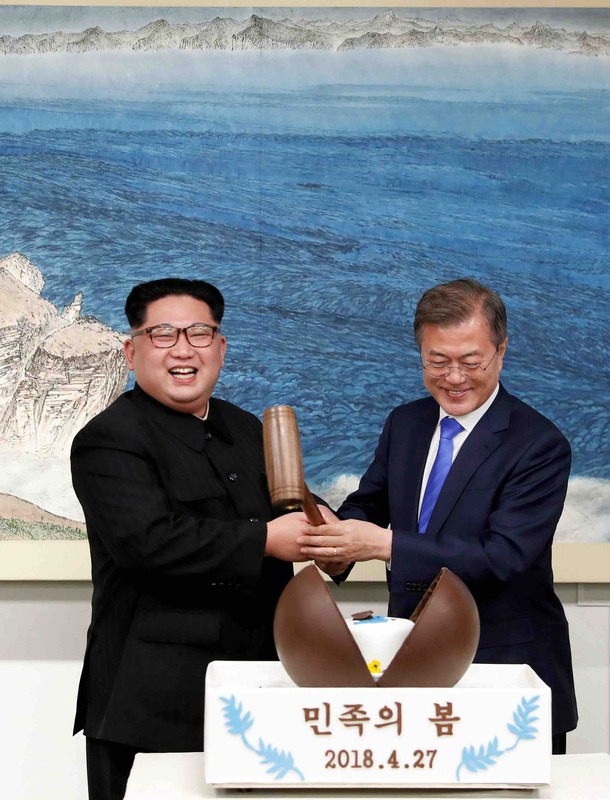 During the first stage of the talks, Kim was quoted to have said that he would be willing to visit Cheong Wa Dae (South Korea’s “Blue House”) if invited and that the two Koreas need to encourage more people to cross the demarcation line to erase national partition. These acts fit with Kim’s recent declaration of a “new strategic line” that will shift the country’s focus from nuclear weapons to economic development. The summit will be a catalyst for reviving Sunshine-era achievements, such as the Kaesong Industrial Complex and Mount Kumgang tourist resort. Planning will also be possible for reconnecting North and South Korea’s rail lines and roads. Moreover, Kim understands that as long as he can maintain talks with South Korea, he can restrain the US, in case the Trump-Kim summit fails. Moon wore a blue tie, the colour of the Korean Unification Flag, to greet Kim at the demarcation line. 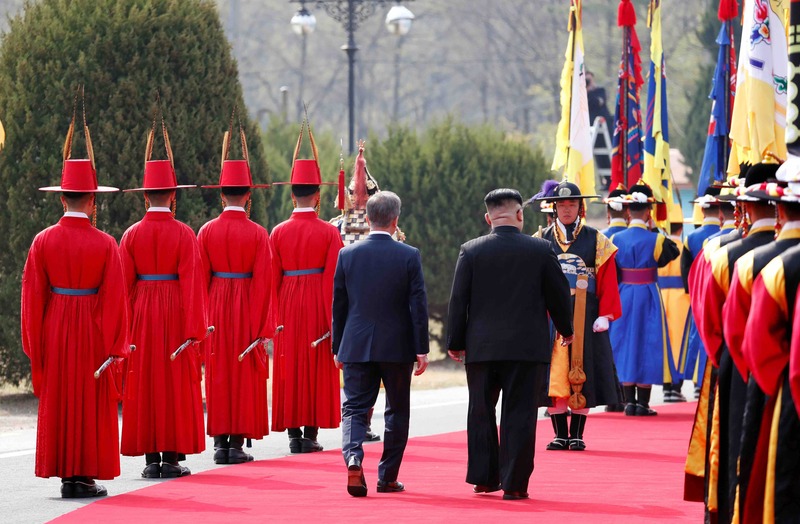 He also gave Kim a Joseon royal guards welcoming ceremony that was also used when Trump visited South Korea in November last year, elevating the North Korean leader to the same level of other heads of state. Moon even promised Kim a “much better ceremony” if Kim were to visit Seoul in the future. Moon has been the driver of North Korea’s diplomatic rapprochement with the US, as his shuttle diplomacy helped Washington and Pyongyang find a common ground. Moon certainly wants to continue this momentum to avert a nuclear war and to strengthen his achievements as a liberal president. His promise of future visits to Pyongyang and Seoul signifies that he is prepared to facilitate North Korea’s reengagement with the international community and play a central role in any attempts by the US and Japan to denuclearise and normalise relations with the North. Moon’s balancing act between Pyongyang and Washington will continue as long as he can keep Kim and Trump at the negotiating table. The two Korean leaders marked the achievements of the summit by planting a sapling from a pine tree that was originally planted in 1953, the year the Korean Armistice was signed. The soil of the pine tree was taken from Korea’s northernmost Mount Baekdu and southernmost Mount Halla and the water was extracted from Pyongyang’s Taedong River and Seoul’s Han River. The popular song “Arirang Alone,” which is about Korean unification, may have been an inspiration for this ceremony. South Korean musician Cho Jong-pil sang the song at Pyongyang’s Ryugyong Chung Ju-yung Gymnasium, which was also used for South Korean K-pop stars this year, and was well received by the audiences when he visited the country in 2005 for a solo concert. 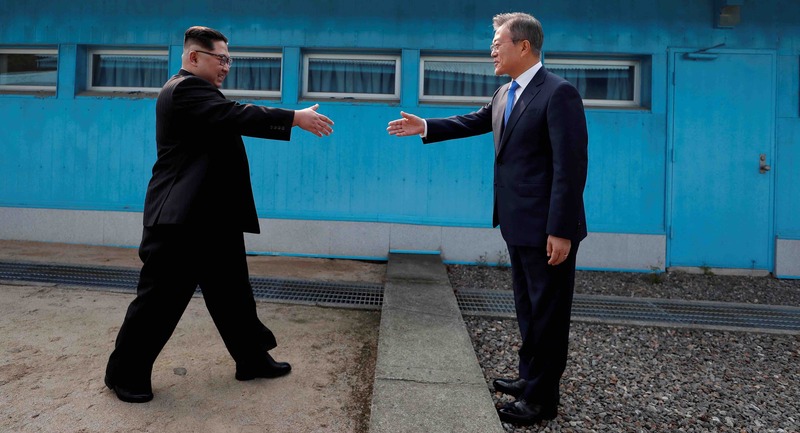 The fact that Kim is the first North Korean leader to cross the demarcation line to visit South Korea is a major propaganda coup for Moon, given the two previous summits took place in Pyongyang. This break with tradition presents Moon with an opportunity to consolidate the results of his engagement policy on South Korean soil and put pressure on his successor to sustain inter-Korean cooperation. Moreover, Friday’s achievements will help smooth the resumption of joint-Korean economic projects and improve North Korea’s image in the South while keeping the North’s nuclear test freeze in place. The symbolic Moon-Kim summit is the necessary starting point for North Korea’s outreach to Japan and the United States. However, this is not the first time that North Korea approaches a liberal president with perceived peaceful aims and provokes Seoul again once a conservative president is elected. Seoul and Washington should welcome this latest friendly gesture but they should also be sceptical of Pyongyang’s long-term intentions.